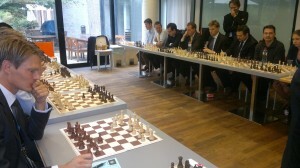 On Thursday 27 September, Europchess had the honour of a visit from top Danish Grandmaster Peter Heine Nielsen. 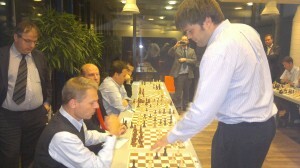 After the legendary Bent Larsen, Heine Nielsen became the strongest Danish player, being constantly among the top 100 players of the world in the last ten years. 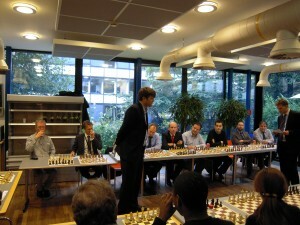 He won the Danish championship several times and got famous as teacher of Magnus Carlsen (the current No. 1 of the world) and second to Vishy Anand (the world champion). He also got very near to the Candidate’s stage, but was eliminated in the penultimate round of the World Cup by the Azeri player Vugar Gashimov. The event was staged at the Danish Permanent Representation to the European Union, the country which held the Presidency of the Council in the first half of the year. After a warm welcome from Jesper Abrahamsen, tournament director of Europchess and main organiser of the event, the grandmaster gave a fascinating power-point presentation about his views on chess. He went into the origins and characteristics of his work, illustrated by a number of pictures and anecdotes. It became clear that chess was cherished in the Soviet Union and Eastern Europe much more than in Western Europe and America until Bobby Fischer and Bent Larsen popularised the game. However, after the spike in the 1970ies (which also lead to the foundation of Europchess in 1973!) interest for chess in the West declined again. Nielsen gave the example that the winner of the Woman European championship, Victorija Cmilyte, was greeted at the airport at her return in Lithuania and made it to national news, whereas the German team was hardly noticed when it surprisingly took the European title recently. 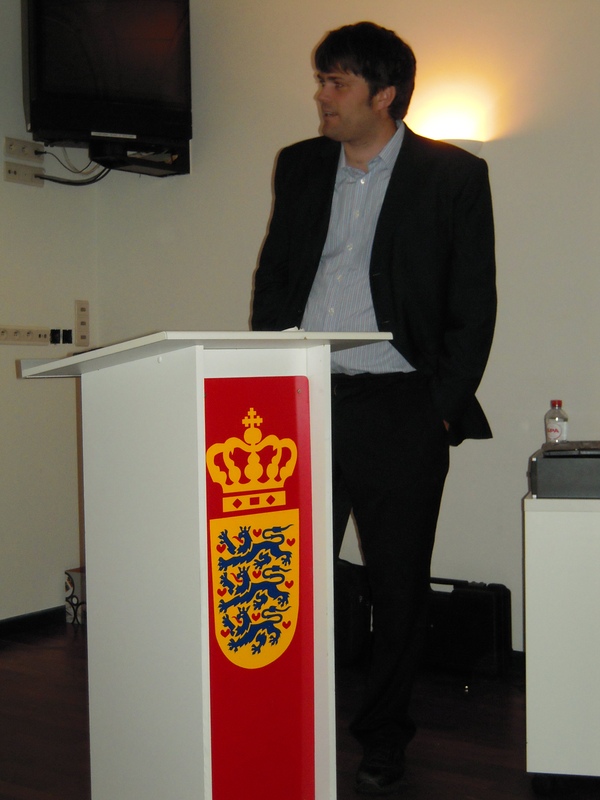 Heine Nielsen also offered his thoughts why women were less present in the top chess ranks. With the exception of Judith Polgar, the former world champion and strongest woman ever who only participated in men’s contests, most women play among themselves. Moreover, as only very few girls start chess, it is statistically not surprising that there are also less top players. The GM expressed his hope that this situation would improve over time, noting that we had at least one female participant (thanks Edit!) in our ranks. In the second half of his presentation, Heine Nielsen spoke about his work with the chess celebrities Carlsen and Anand. He trained Carlsen as a teenager and observed that he was a natural talent with an exceptional positional feel and an extraordinary memory. Carlsen already posed enormous problems to one of the world’s leading players, Lev Aronian, in the World Cup at this age. Later on, when he trained one year with Gary Kasparov, he got another push, but it seems that the two characters clashed over the choice of an opening variation in an important game against Kramnik. 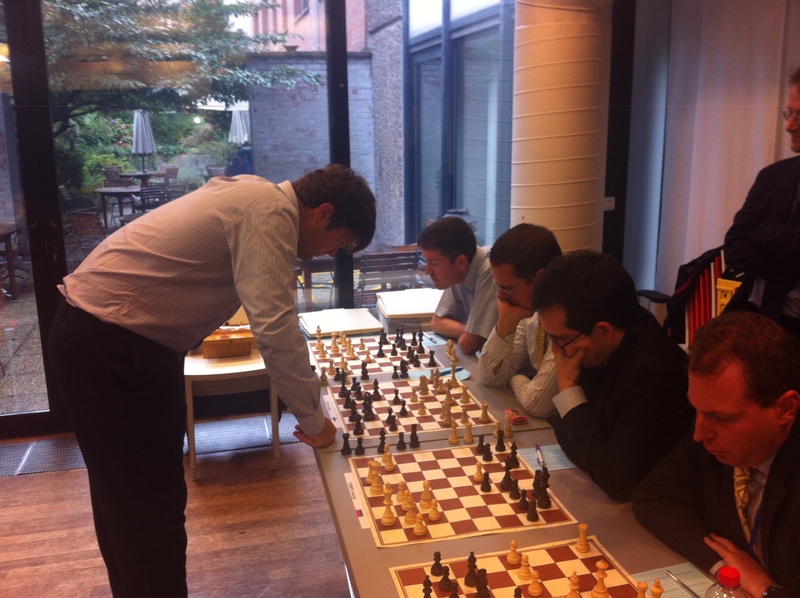 The GM then turned to his recent experiences with Vishy Anand: he was present in the duels with Kramnik (Bonn), Topalov (Sofia) and Gelfand (Moscow). The Anand camp was composed of four seconds, who were constantly trying to improve some opening lines with the help of computers and their own scrutiny. The biggest challenge was to make sure that no “hole” exists and that Anand could absorp a new idea in short time. This was very successful in the novelty in the Meran defence against Kramnik in Bonn (3rd and 5th game), but against Topalov the 1st game got lost due to a memory mistake. 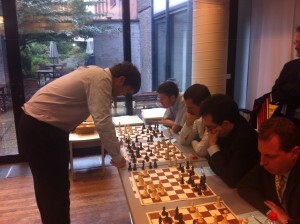 Anand also played very accurately against Gelfand, which proved to be the toughest and narrowest match. The seconds were working very hard, and could hardly enjoy Moscow’s beauty (Nielsen showed a funny sequence of pictures take from the inside and the outside the working room, with thoughtful seconds before computers in a rather stiffy cellar and a brilliant colourful view on Moscow by night). Probed whether he would not need the time to work rather for his own career, he replied that working with the world champion would be the best way to improve one’s own skills as well. Anand had very good relationship with his seconds which also allows using knowledge gained during the joint preparation. That was an additional motivating factor. 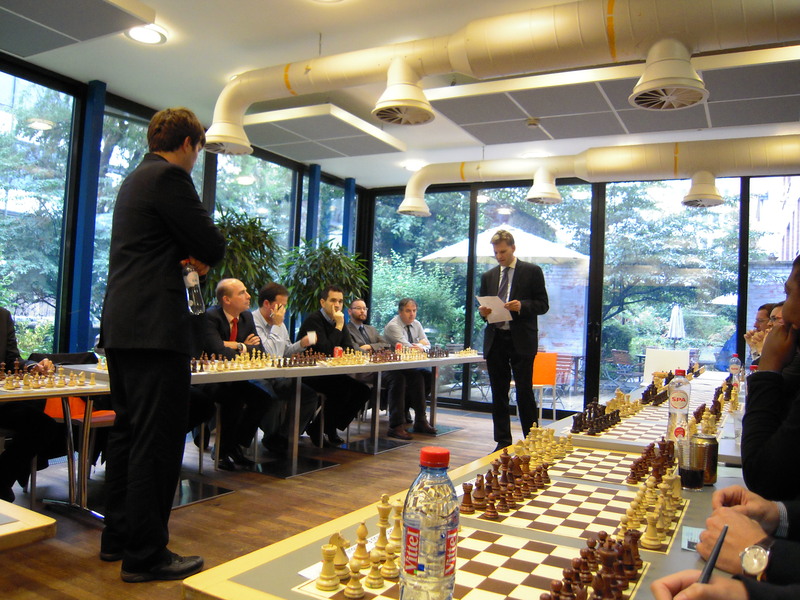 After this presentation, which was attended by 35 participants, including from other Brussels based chess clubs, Peter Heine Nielsen gave a simultaneous exhibition against members of Europchess. This proved to be anything but an easy ride, as President Frank Hoffmeister predicted. He was facing a motivated and strong selection from a variety of EU Member States, which would be able to play anything from the Ruy Lopez, the English opening, the Scandinavian Defence or even the Budapest Gambit! In a field of 23 players, Nielsen scored 14.5-8.5 points. For our club, Kristian Pade Frederiksen did not show Danish solidarity and took the full point, as did Tomas Wiley (UK), Johannes Bertram (DE) and Jenö Czuczai (HU)! A solid draw was delivered by no less than 9 players, namely Georgi Tomov, Ismo Ulvila, Eduardo Semanat Planas, Serge Le Gal, Jesper Abrahamsen, Martin Müller, Georges Vassilakis, Jozsef Barta, and Luis Miguel Parreira. 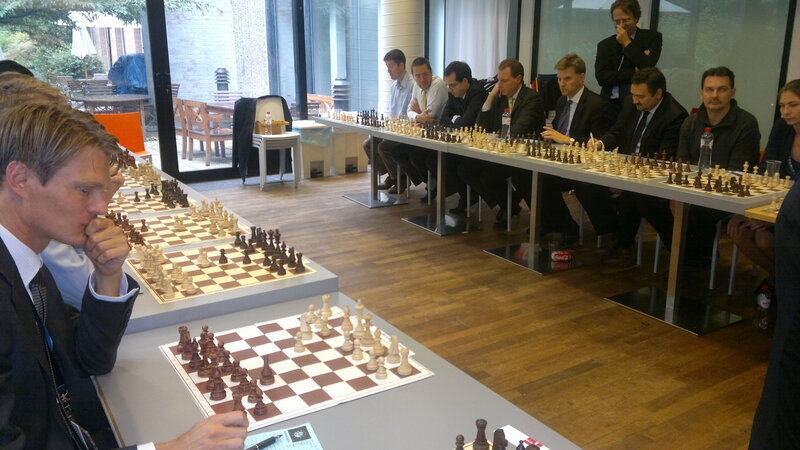 On the other hand, the GM overcame resistance from Frank Hoffmeister, Mattias Johannson, Manolis Grigoriou, Bruno Gatta, Piotr Rapacz, Pavel Cernoch, Bertel Christensen (Danish Embassy), Paris Sansoglou, Edit Kollo and Jose Maria Ramos Florido. After this tough battle, Europchess Board Members Jesper Abrahamsen and Kristian Pade Frederiksen invited the Danish GM for a well-deserved dinner, which proved to be a very sociable evening. On the next day, Pavel Czernoch (Parliament), Jenö Czuczai (Council) and Frank Hoffmeister (Commission) made a guided tour through the relevant institutions in order to complete his visit to Europchess. 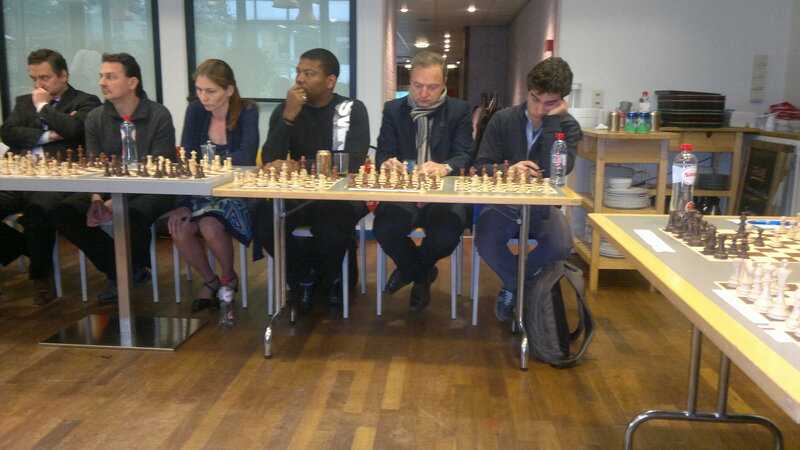 Based on voluntary contributions, we hereby attach some games from the simultaneous and would like to thank again and publicly, Peter Heine Nielsen, for this great chess event.